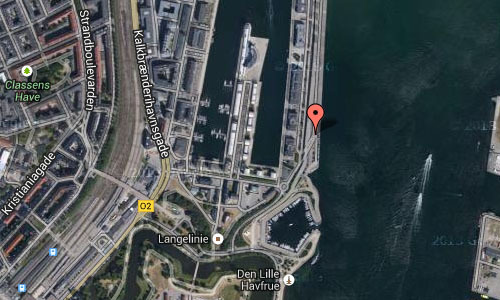 The Langeliniekajen or Langelinie Pier is located in the harbor of Copenhagen, the capital of Denmark. The Langeliniekajen has a water depth allowing big ocean-going vessels to tie up. The area has a number of statues and memorials. These include a cast bronze sculpture polar bear with cubs and memorials for MS Jutlandia, Ludvig Mylius-Erichsen. The polar bear has some bullet holes at the head. They were made by a German soldier under the Occupation of Denmark. 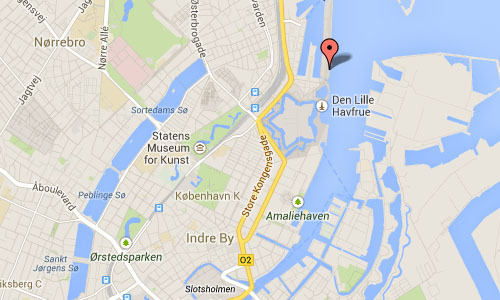 Langelinie is a pier, promenade and park in central Copenhagen, Denmark, and home of the statue of The Little Mermaid. The area has for centuries been a popular destination for excursions and strolls in Copenhagen. 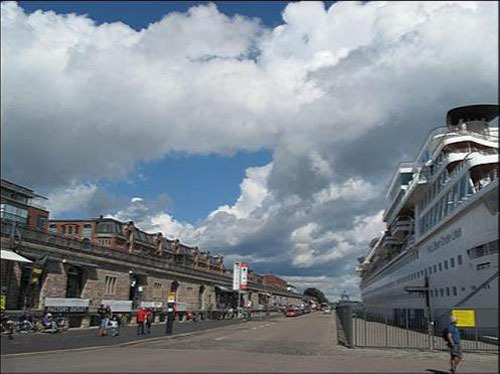 Most cruise ships arriving in Copenhagen also berth at Langelinie Pier. If you’ve got an hour or two to kill before departure, or if you’d rather not haul purchases from the city center to the ship, allow time for a visit to the Langelinie Quay Shopping Arcade. Beneath the stone arches of Langelinie’s old warehouses, you’ll find shops that sell porcelain, amber, Danish clogs, jewelry, clothing, and other products. It is the “МАРИЯ УЛЬЯНОВА” (MARIJA UL’JANOVA, later LR transcription MARIYA ULYANOVA) – built in 1959 at the Mathias Thesen Werft of Wismar in the new German Democratic Republic, the shipyard which has built most passenger ships over 1000 GRT in the world after 1945, one of 19 similar sister-ships, the largest ever built sister-ship class in the world of sea-going passenger ships over 1000 GRT. In 1959-1970 she worked for the BMP (Baltijskoe Morskoe Parochodstvo) of Leningrad on the Leningrad-Baltic Sea Ports-Oslo-London-Le Havre line. 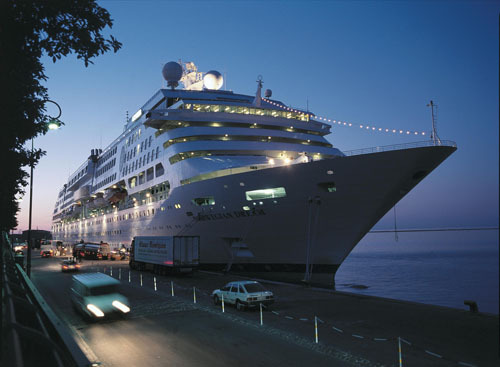 On some routes she continued from Le Havre to the famous revolutionary Isle of Liberty of those days, Cuba and the port at La Habana, most of the passengers being engineers and students in both directions. 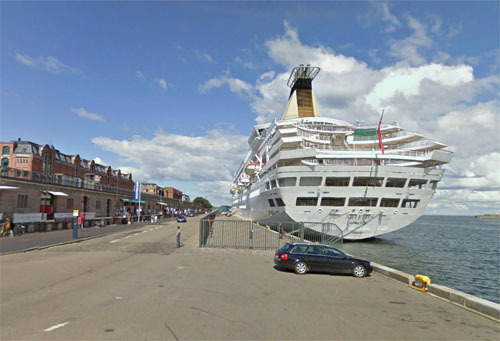 In 1970 she was transferred to the DVMP (Dal’nevostotchnoe Morskoe Parochodstvo) of Vladivostok for the lines between Vladivostok and Primorje ports(coast north of Vladivostok) and some times up to Petropavlovsk on the Kamtchatka. Some times also worked on the long line to Yokohama in Japan and to Hong Komg in China. She left the DVMP/FESCO fleet in 1988 and was reported scrapped as late as in 1996, if this is 100% sure, I do not know. If I remember correctly she was sold to China in 1988 together with her sister-ship ФЕЛИКС ДЗЕРЖИНСКИЙ / FELIKS DZERZHINSKIJ (built in 1958 for Tchernomorskoe Morskoe Parochodstvo/BLASCO) of ODessa for the Black Sea-Mediterranean regular lines. 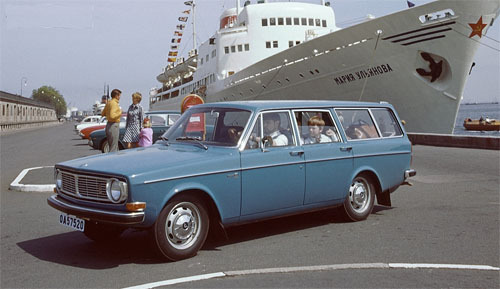 She was also transferred from European waters in 1970 to the Pacific ocean lines of DVMP. These ships had another 11 sisterships, 7 scientific vessels built for the HydroMet Services of the USSR and the Academic of Sciences of the USSR (one of them still is the ГЛОРИЯ / GLORIJA, passenger ship out of Odessa). and another 4 sister-ships for the VMF SSSR (USSR Navy) as oceanographic measuring ships. One of them still in service, the former ADZHARIJA (not the passenger ship, another vessel of this name was built for VMF SSSR, hence being two sister-ships with the ADZHARIJA name!) – now renamed to КРОНШТАДТ / KRONSHTADT and being laid up at the Kronshtadt Navy Base in the Leningrad Oblast’ at the island of Kotlin, the world-famous revolutionary navy base of Krosnshtadt of the Baltijskij Flot (the Baltic Sea fleet). More information on en.wikipedia.org, www.visitcopenhagen.com and www.langelinie-outlet.dk.